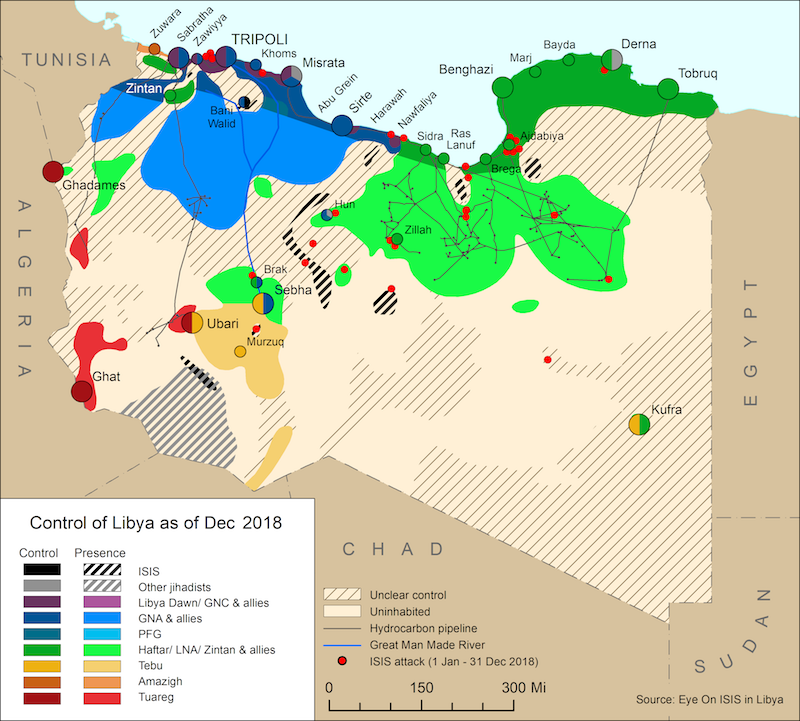 On 21 June, Khalifa Haftar’s Libyan National Army (LNA) succeeded in retaking the Oil Crescent from forces under the command of former Petroleum Facilities Guard (PFG) commander Ibrahim Jadhran, recovering territory it had previously held up to Harawah just east of Sirte. This was achieved despite Jadhran’s forces outflanking LNA contingents in Ras Lanuf and killing at least 16 LNA fighters, before being forced to retreat under LNA aerial bombardment on 21 and 22 June. On the night of 23 June, unidentified aircraft bombed Saddadah castle, targeting a mixture of Jadhran and Benghazi Defence Brigade (BDB) forces that had retreated from the Oil Crescent clashes. 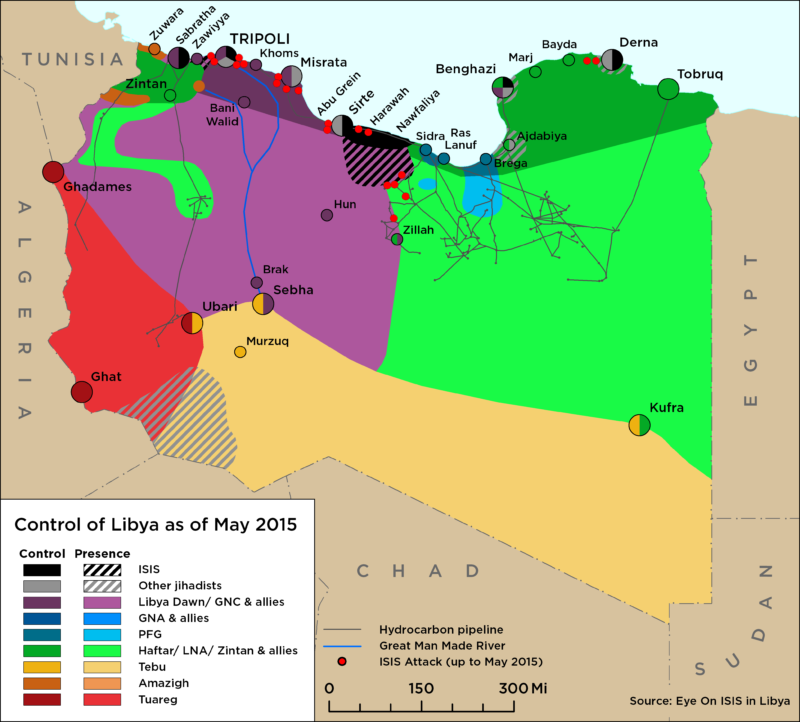 On 22 June, the National Oil Corporation (NOC) confirmed that Sidra and Ras Lanuf oil ports had been liberated from Jadhran’s forces and were now back under the control of the LNA. Jadhran’s forces seized the ports on 14 June and the NOC declared force majeure on loadings from the ports on the same day. The NOC said that more than 400,000 bpd in oil exports had been lost due to the violence and had cost billions of dollars of losses. Sidra escaped relatively unscathed, but two storage tanks at Ras Lanuf were destroyed. At least 16 LNA fighters were killed in the clashes. On 25 June, the LNA spokesperson Ahmed al-Mismari stated that Khalifa Haftar had ordered the all ports ‘liberated’ by the Libyan National Army (LNA) to be handed over to the Benghazi-based National Oil Corporation (NOC), under the auspices of the Bayda-based parallel (interim) government led by Abdullah al-Thinni. The statement said that the eastern NOC would maintain contracts signed with international firms but would not engage with any oil vessels that the interim government and eastern NOC has not approved. Mismari further specified that, ‘no tanker will be allowed to dock in eastern ports without permission from the NOC based in Benghazi’ and that going forward a clearance from eastern NOC Chairman Faraj al-Hassi will be required for anybody wanting to enter the Oil Crescent. This clearance is being demanded for the alleged purpose of preventing ‘terrorists’ from receiving salaries from the oil revenue via Tripoli’s Central Bank of Libya. In the statement Mismari accused the NOC based in Tripoli of neglecting eastern security forces’ efforts to secure the Oil Crescent.